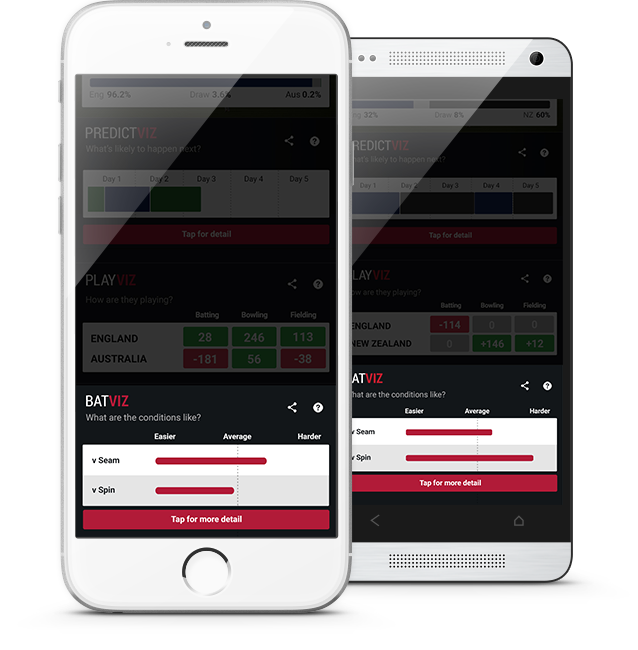 CricViz allows the user to understand cricket in greater detail than ever before. 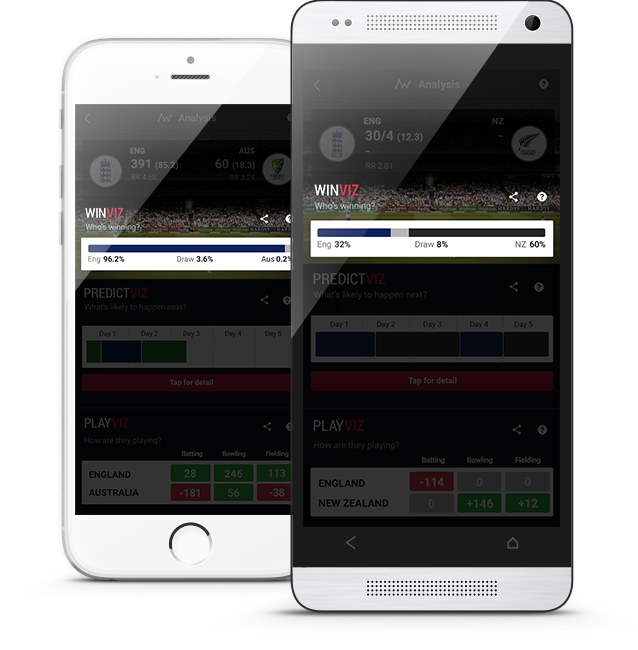 The unique CricViz computer model enables the prediction of match outcome, the interpretation of team and player performance and the anticipation of what is likely to happen next; cricket intelligence at the next level. WinViz probabilities are generated by CricViz’s unique computer model of Test cricket. This utilises a database of the last 500 Test matches played, using past and current data to estimate the probability of future events. The model uses the current state of the match, each player’s career history and characteristics of the venue and host country to simulate the remainder of the match. The simulations are run thousands of times, with the number of results that produce each match outcome converted into probabilities – if 4,000 out of 10,000 iterations result in a team winning, then that team has a 40% probability of winning. 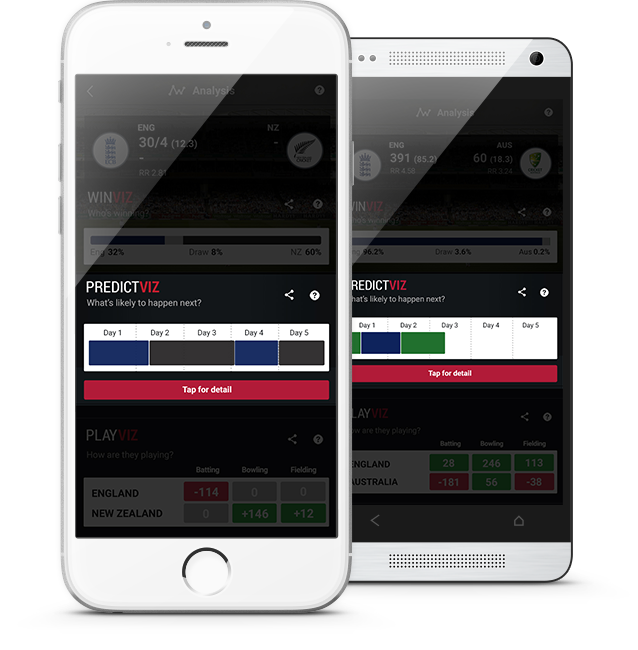 The PredictViz function outlines the most likely course the match will follow from its current position. The unique CricViz model of past and current data simulates the remainder of the game thousands of times, with the average predicted outcome for each team plotted across the game’s remaining timeline. The likeliest score and end point of each innings is predicted using the current state of the match, each player’s career history and characteristics of the venue and host country. Team performances are compared to those of an average Test team, with adjustments taken into account for the pitch and opposition strength. The comprehensive historical database predicts the average performance of batsmen and bowlers in the position and role they are playing in. 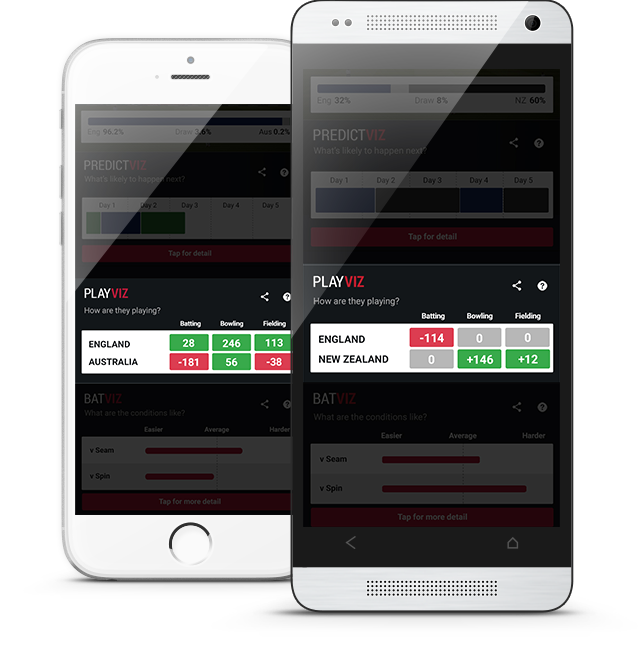 The PlayViz function measures performance relative to averages that take into account extra variables. Each team’s fielding performance is measured on the direct impact it has had on the score. Runs saved and missed are totalled for each player, with a dropped catch measured at the value of the wicket that was missed according to the model of projected scores. Fielding scores are adjusted by a system that rates the difficulty of a piece of fielding. BatViz gives a measure of how difficult batting has been in the last 30 minutes of play. It shows how hard it is for the batsmen to survive and score. The ball tracking data from every ball bowled in the match is compared to a database of over 300,000 Test deliveries. The balls in this database that are the most similar to the delivery being measured are evaluated in terms of wickets taken and runs conceded, with a game aggregate built to provide a metric of current batting difficulty at that time.